So as the cold of winter continued and the New Years resolutions floated fresh in mind the final term of my “final” term in Kobe Japan began. It was the long weekend to celebrate the Coming-of-Age of all the 20-year-olds in this country. 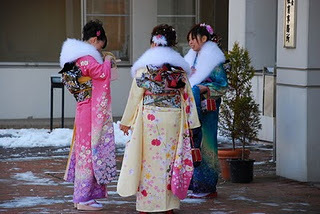 Most “New Adults” had spent Monday, January 16th decked out in gorgeous kimonos or handsomely wrapped in new suits at city halls throughout the country. Mayors had made their “welcome to the real world” speeches and most new “legal” adults had gone out to the bars to finally drink without fearof being caught as an under-ager. It was cold…I recall it was super cold and my best friend, Kristin and I had enjoyed a nice evening relaxing with wine and getting ready for our next day at work. I’d made a quiz for the teachers for the all-staff morning meeting and had stayed up until about 3am to do it. I couldn’t sleep. It struck me as odd; perhaps I was simply excited at the prospects of my move to Toyama in March…finally at about 3:30 I fell asleep. 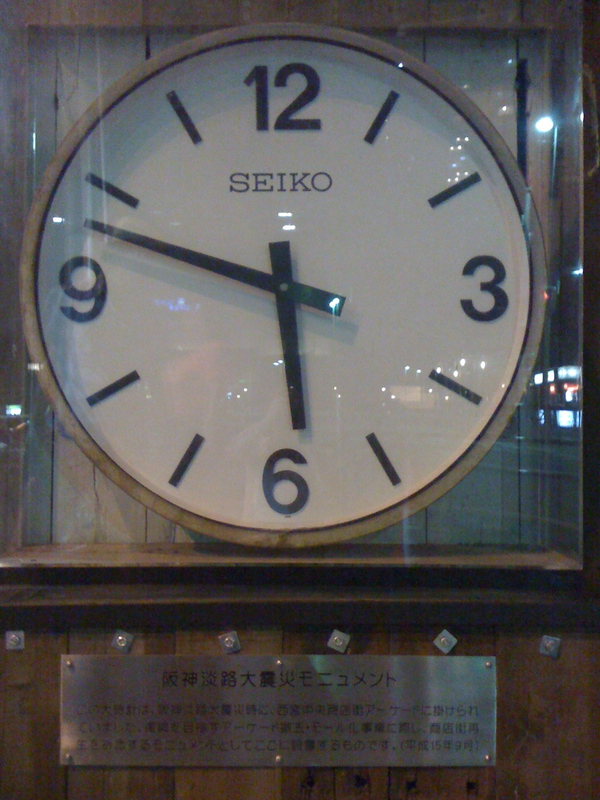 Clock in Sannomiya Stopped at the exact time the 1995 earthquake happened. It is still there today. And then, it did. The violent shaking stopped, but I could feel another wave coming on…first thoughts, “Get the hell outta here.” And that is ALL I wanted to do. My room has two doors, one which leads into the living room and the other directly into the kitchen which has a door directly out to the hall leading to do the only exit in our apartment. Unable for some reason, to escape through that door, I ran through the living room straight into panicked shouts from a towel-wrapped roomie, NOT to go through the kitchen without footwear…our extravagant Christmas dinner glasses, plates and bowls all in dangerously wound inflicting pieces all over the floor. I was so relieved to know she was safe but horrified to think she’d been showering when the quake occurred. Minutes later we were at the exit door trying fruitlessly to pull it open…the quake had sealed us inside a still-shaking building 6 floors up in a building set RIGHT on the seafront…venturing timidly to the balcony, we calculated how far out we’d have to push to actually miss the tetrapods and hit the sea water below. THAT wasn’t going to happen…(I cannot express enough how very happy I am now to have been naive enough at the time not to have known how tsunamis are caused…) So, back to the exit door and desperate attempts to edge open our frustratingly uncooperative cast iron door. One last pull and it in fact eased open enough for both of us to sneak out. …was she kidding?! Nope…since all she had on was the blanket, it turns out she was not! So, back in we go…to change. 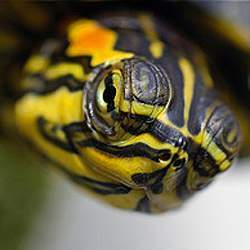 Building still shaking…crazy…but then I recalled my turtle “Buddy” was somewhere in the rubble, so we loaded him up, checked on our neighbours, who were in fact fine, and hopped in my car and ripped out of the parking lot. It was so incredibly quiet…for a while. Then the ambulance sirens started to scream. Looking around our area, it was impossible to see that any real damage had happened. We decided to drive up to our respective schools to see what had happened there. Still nothing too major, but then we noticed the fires breaking out in the roads and some splits in the streets where the ground had heaved. We decided it would be a good idea to call home and let them know we were okay…because surely this would hit the news…we had NO idea what had happened a short few kilometers away and how the entire world would soon hear about this disastre. Both families contacted, we checked in with both schools and helped out a bit before heading home. On our way back, we thought it would be a good idea to fill up on gas and get a little food. Instinctively smart and lucky call, because later in the day that would mean having to stand in enormous lines and wait in kilometer-long snakes of car line ups at the stands. Upon reaching our apartment, we were met by a note written in English from our new police officer friend, who’d popped over with some water and left it in front of our door for us before heading out on rescue duty to the more afflicted parts of the city. He hardly even knew us, but knew enough to understand what we’d need in such a situation… This, my friends, is Japan. The Japan I will always love. Sigh…so, the tsunami thankfully did not occur, which is a good thing, because we were back in our apartment not too long after the earthquake had hit. We felt very blessed. 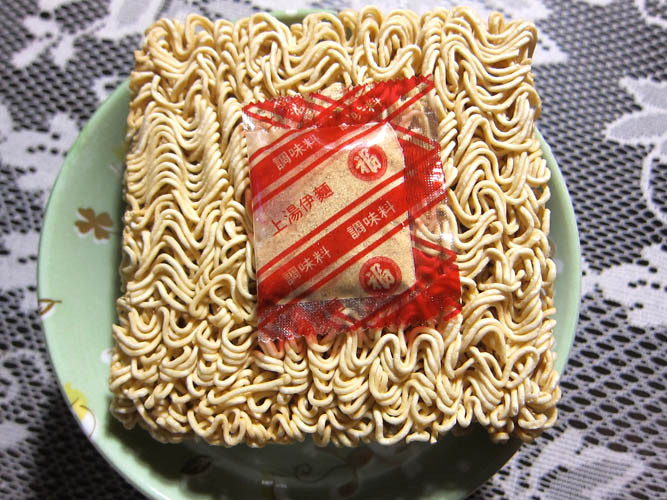 Later that day, the police officer’s friend, the construction guy, came over with dried instant noodles and uncooked rice for us to “survive” on. How did we fall upon such fortune and inadvertently meet two great guys who would,throughout this ordeal, help us in ways we could never have expected? The shakes continued for days after the initial quake. Contact with the outside world was impossible for at least a week, and the broadcasting on T.V. and the radio was all in Japanese, so we really had no idea what to do. It was a time of dependence, and we did just that, depended on people. Our schools were generous and the staff and parents of our students had advice and incredible offers for us to bathe eat dinners with their families. My school at the time became a relief center and the gymnasium a temporary housing site for 80 families. Our principal was stoic, and made the remarkable trek from his home each day, which later I discovered was a 4 hour ordeal, each way. Also, unknown to most of us, until much later, was that his home, which had just been fully paid off before his upcoming retirement, was completely destroyed in the earthquake. Realizing that, in these conditions, I’d be of no help at the school whatsoever, I asked the principal if I could do volunteer work in the areas most affected by delivering relief goods on my scooter. Permission was granted and I spent the next 2 and a half months giving back to a city that had given me so much so far. Lifting roofs up off the ground so grandma could get grandpa’s ashes encased in the “butsudan” (a traditional in-home buddhist altar), or a return to the relief goods center to find the right size hearing aid batteries, or the proper size underwear for the many who stopped this foreigner on the relief goods bike. So many just wanted to talk…I hardly ever knew what the actual words were, but I knew what they were saying…and for the first time in my entire time here, hugs were no longer uncomfortable moments, but long and plenty. “Mata kimasu ne” (I’ll come back again soon, okay?) I’d say, and humbly, they would bow. My heart burst with a pain I could never fully explain to anyone back home. And I would go back, because in the whole scheme of things, nothing else mattered. It was in these 2 and a half months that I realized it would be a long time before I’d actually leave Kobe, Japan. The Toyama thing never happened and here I am, 20 years later still in Kobe, Japan, still in the same apartment by the sea. My roommate Kristin long having returned home to return to school, recently became a full-fledged M.D.. Flash forward to the month before my 20th anniversary here…On March 11, 2011, the most devastating earthquake this country has ever experienced happened while I was on a trip with 80 students to Hokkaido and though it had been 16 years since the Kobe quake, the indescribable terror returned and again, the entire country was thrown into “survival mode.” This time, the horrors of the tidal wave, or in Japanese, “tsunami”, brought the damage and death toll to unimaginable numbers and the entire world looked on as one of the most “secure” nuclear power plants changed our definition of “safe”. As I write this post, it is October 2011 and six months have passed. The earthquake news has long faded, but the scars of devastation remain. 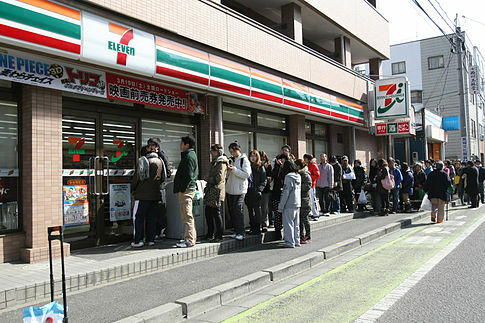 Still, the country forges on…and though recovery is going to take a great deal of time, the Japanese will do just that. Recover, overcome and push forward. As is being proven in so many ways all over the world, it is certain that true security has less of an external meaning than most of us have come to believe. As for myself, once again, I have been reminded that our days are numbered and that we simply have got to make the best of every moment we are blessed with. Carpe Diem! Thank you for sharing your experience with the Great Hanshin Earthquake. I know exactly how you feel being someone who lived through the recent disaster. I could never explain my pain to anyone back home either, nor could anyone understand it. You’re right, while it does take a long time, just like every other people on earth… the Japanese will overcome. I can’t say I’ve fully overcome from my loses since that day, but it’s a working progress. Thanks again for your post. Thanks for your comment. 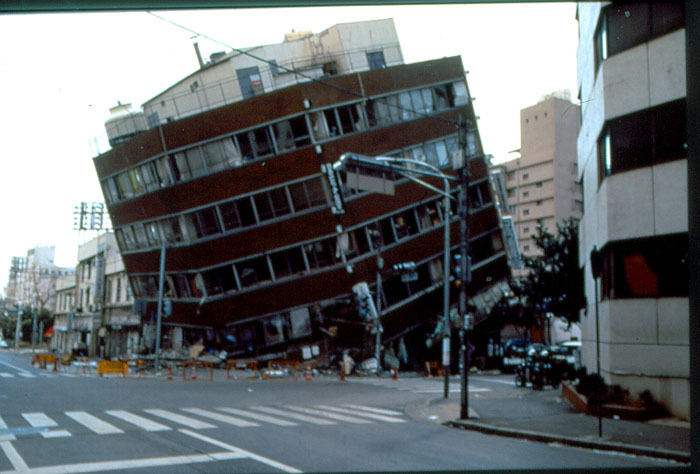 Where were you when the Tohoku disastre struck? The magnitude and span of destruction that ravaged that area makes the Kobe earthquake pale in comparison. It has taken years for most people to get back on track here, physically and on the deeper side, emotionally. How are you coping? How have you been affected? I would love to hear your story. How do you feel the situation has improved in the last while? I’m a musician, and we held a charity event as soon as we could manage to do our part to help, even in a small way, financially and eventually spiritually (we are editing a video message). Can you think of other things that we (those of us living outside of the area) can do to continue to help? Again, thank you for posting your comment. I have read your post/blog a few times now and understand that the earthquake was the catalyst that compelled you to stay. What is not clear to me however is, what was it that you connected with specifically….. (and, not wanting to put words/thoughts into your head i will refrain from providing and conjecture regarding your very personal experience). If you are still out there somewhere….I’d like to try to answer your interesting question. If I try to keep it simple, I’d say it was understanding that I wasn’t so “foreign” after all, and that it was, in fact, possible to connect with people here. 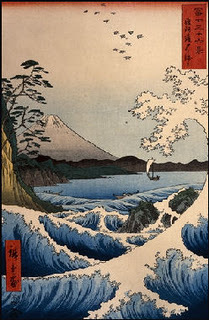 I was remarkably intrigued with all of the peripheral stimuli of Japan, the history, the customs, the beauty, but without the language, I’d found it remarkably difficult to truly connect to people. It made me feel like an outsider in so many ways, it is hard to describe. I also felt so thankful to have a chance to do something meaningful here. At the time, I was really at the peak of what I could do as an assistant teacher in a junior high school, and I felt unchallenged. So many unusual and challenging opportunities flowed my way after the earthquake (which I will write about in further posts…and though I suspect at this point, that’s a bit hard to believe since I’ve been so lax in posting since I began this blog, for which I am sorry) I was also fearless after living through the disastre. So, I tried everything, even things I should never have attempted…and doing so led to more and more and more daring challenges, and more interesting connections. I’m not sure if I’ve completely answered your question, but feel free to ask me more and I’ll do my best to tackle an answer.